Time for the end-of-year party, folks! It’s an AMERICAN COUNTRY BARN DANCE with food and drink. BOOK BY 12TH JUNE AND GET THE FULL MENU FOR 10€. There’s a free cowboy hat for all Club members and for the first 30 non-member bookings!! 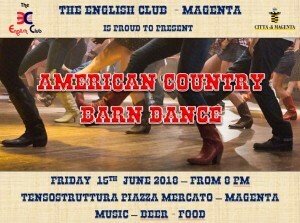 It will be held in the tensostruttura (in Piazza Mercato – Magenta) on Friday 15th June from 8pm. We will be serving the Barn Dance Menu of Hamburger or Hot Dog (Don’t panic, it’s Italian sausage!) together with fries or beans and a drink (beer, Coke or water). For those of you who don’t want the full menu we are asking for a contribution of €5 which includes a drink. The menu items, together with muffins and cookies, will also be available separately. 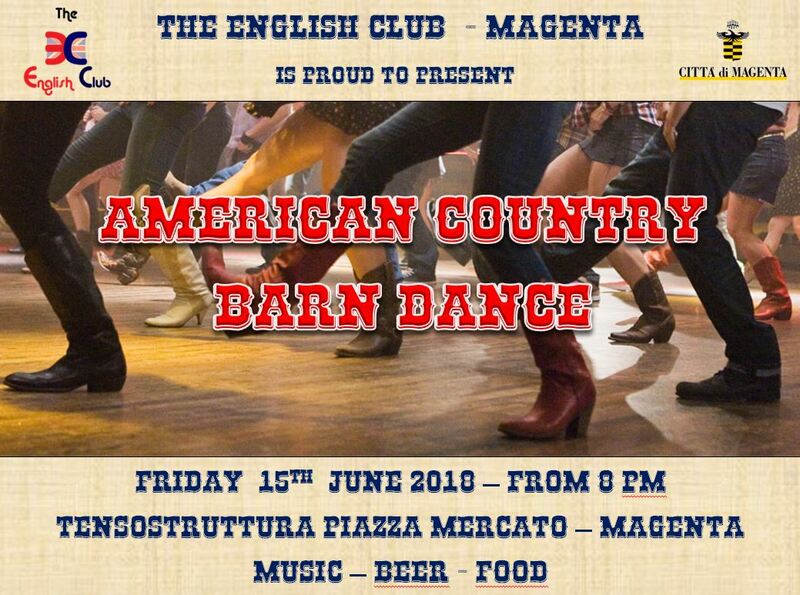 During the evening you can watch a short performance by the students of the PassoGiro dance school and then you can join in the Barn Dance with them. That should be fun! All Club members, plus the first 30 non-members, get a free cowboy hat when they book the Barn Dance Menu. You don’t really need cowboy boots to be a cowboy (or a cowgirl!) but remember to wear comfortable shoes! Whatsapp the numbers below for more info and bookings.Please leave your name!